Catherine S., actual patient, model and student. CRUTCHFIELD DER MATOLOGY Experience counts. Quality matters. At your request, Dr. Crutchfield will personally see any patient on a same week and even same day appointment for your patients with acute dermatologic needs. 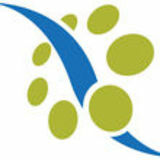 Specializing in psoriasis, acne, vitiligo and ethnic skin concerns. Dementia: Toward a Greater Understanding By Richard R. Sturgeon, M.D. Forget Me Not By Carolyn A. McClain, M.D. Colleague Interview: A Conversation with Anne Murray, M.D. Alzheimer’s Disease: The Future of Diagnosis, Prevention and Treatment By Michael Rosenbloom, M.D. Traumatic Brain Injury as a Risk Factor for Dementia: Where is the Science and What are its Implications? By Jessica Flores, MS2 and Uzma Samadani, M.D., Ph.D. The reality of dementia’s effect on the human brain. Articles begin on page 6. MetroDoctors reserves the right to reject any article or advertising copy not in accordance with editorial policy. Advertisements published in MetroDoctors do not imply endorsement or sponsorship by TCMS. 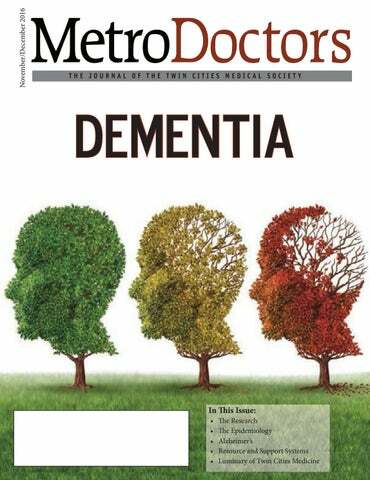 Non-members may subscribe to MetroDoctors at a cost of $15 per year or $3 per issue, if extra copies are available. For subscription information, contact Andrea Farina at (612) 623-2885.
and tau. This relationship will be critical in shaping diagnostic approaches and clinical trials. He points out that one needs histopathology for definitive diagnosis and in the antemortem state, one can only have “probable Alzheimer’s.” He presents a very complete picture of the current Alzheimer’s diagnostic and classification information. Looking into the future, he expects dementia research conducted in Minnesota and nationwide to make significant progress in diagnosis, prevention and treatment. Soo Borson, M.D. and Patricia Carlson, MPH emphasize the growing challenges to clinicians and health systems related to increasing incidence of age-related neurodegenerative dementias. Our longer living population’s effect on healthcare delivery calls for system and policy reform with a central focus of new federal legislation and Medicare policy. The National Alzheimer’s Plan (“NAPA”), in a series of recommendations by its Advisory Council of researchers, clinicians and policy experts, has articulated strategies for enhancing the productivity of research on basic mechanisms of neurodegenerative disease and development of new biological treatment targets and new therapeutic agents. Jessica Flores, MS2 and Uzma Samadani, M.D. summarize the current ambiguous scientific pathology literature regarding Chronic Traumatic Encephalopathy and dementia associated with traumatic brain injury. It is clear brain injury is absolutely, unquestionably injurious to the brain with complex multifactorial consequence. A single brain injury is unlikely to cause dementia but is associated with potential psychiatric consequence. Our authors suggest useful information sites for caregivers and patients. Several of these toolkits are already in widespread use with some of our health systems. Our Luminary Sanne Dail Jones Magnan, M.D. has positively impacted Minnesota health care delivery. She led Statewide Policy as our Health Commissioner and influenced quality assurance at the grassroots level with her leadership of ICSI. Thank you Dr. Magnan. Forget Me Not CAROLYN A. McCLAIN, M.D. “IT’S TERRIBLE. THE NEIGHBORS HUNG THEIR CHILDREN FROM THE TREE. Working in partnership with the City of Minneapolis Health Department, Minnesota Department of Health (MDH) and the local Diabetes Prevention Network, TCMS is currently engaged in activities to educate physicians about prediabetes, encourage screening of patients and referral to a diabetes prevention program (DPP). Efforts to date include: a webinar “Turning the Tide — Easy Tools for Clinicians to Prevent Type 2 Diabetes,” which is being produced featuring Drs. Kacey Justesen and Steven Vincent describing the science behind prediabetes and how to successfully refer to a diabetes prevention program. The webinar will be available in November. Targeted Minneapolis clinics will receive an information packet from TCMS and Minneapolis Health Department including a letter explaining how to access the new MDH Diabetes Prevention Call Center, how to access the webinar for their providers, sample patient education and AMA toolkit promotion materials, and a provider guide/infographic to use as a guide for providers to refer their patients to the Diabetes Prevention Connection for DPP classes. Contact Nancy Bauer at TCMS for more information: nbauer@ metrodoctors.com. that shorter sentences help. Any sentence that requires a second breath may be too long. For me, big words are not as daunting as long, complex sentences. Separating choices into two short sentences, at least by cadence, is a big help. However, I certainly do not want anyone to simplify or “dumb down” their vocabulary. Being able to gauge an appropriate level of communication to a specific person should certainly be guided by your knowledge of the person’s prior life and medical history. I have found all of my doctors to be helpful (I would not go back if they were not.) I have been impressed with how supportive they have been and how they project a feeling of empathy and caring for my situation. I have not pursued treatments outside of our medical programs. I am a scientist and would find it hard to think that on my own I could find therapies that are unknown to the medical profession. I am interested in taking part in clinical trials that are testing new therapies. (Now, I would of course prefer to only enroll in ones that are guaranteed to cure my Alzheimer’s, but for some reason those are hard to find.) Currently I am in a 26-month drug study of subjects with amnestic MCI due to Alzheimer ’s disease. Of course, I do not know if I am taking a placebo, the low dose or the high dose of the drug, but, for me, it seemed only natural to want to be involved in a clinical trial. Alzheimer’s is a terrible disease. Until we have a cure, the best way to soften the effects of dementia is through the support of family and friends. It is the personal connections that sustain my wife and me. The medical professionals, the people at the Alzheimer’s Association, and the many people we have met in various programs have been a great source of information and are a continuing emotional support. I know I am not alone on this journey, and that makes all the difference. I have Alzheimer’s, but Alzheimer’s does not define me. In a way, I had to have a funeral for the old Marv and now learn to live as the new Alzheimer’s Marv. The new Marv is very open with people about the memory loss and what that means for my ability. Both Old Marv and Alzheimer’s Marv cohabit in me, and both are constantly changing. There is certainly a flow over time that brings more of Alzheimer’s Marv, and weakens and reduces the presence of Old Marv. But the lines are not a firm separation, and there is a flow between the two faces of the one Marv. I am still Marv, and that is what matters. Marv is always open to meet with physicians and/or groups about this journey with Alzheimer’s disease. Please contact Karen Peterson, Executive Director, Honoring Choices Minnesota, kpeterson@metrodoctors.com. nne Murray, M.D. is the Medical Director, Berman Center for Outcomes and Clinical Research at Hennepin County Medical Center. She received her medical degree from the University of Minnesota Medical School; M.Sc. from Harvard School of Public Health (Epidemiology); completed a residency in Internal Medicine at Mayo Graduate School of Medicine; a Fellowship in Geriatrics, Division on Aging at Harvard Medical School, served as a Kellogg Fellow, Harvard University School of Public Health, and a Hartford Foundation Research Fellow. Dr. Murray is a Professor of Medicine, Clinical Scholar Track, University of Minnesota Medical School and a Faculty Member in Gerontology, the Graduate School University of Minnesota. She is a former President and Chair of the West Metro Medical Society (Twin Cities Medical Society). Is dementia a disease or simply the aging process? Dementia is a disease and is not part of normal aging. About 10% of current adults can expect to develop dementia before their death. The prevalence of dementia increases exponentially with each decade after age 65, to about 10% between ages 6574, 20% ages 75-85, and over 50% for those ages 85 and older. Please comment on the various forms of dementia — the etiologies, frequency, clinical course implications and as a comorbidity with another condition such as Parkinsonism or chronic kidney disease. Entire textbooks are written regarding dementia, so we’ll stick to the basics. Dementia is the umbrella term for chronic global cognitive impairment that encompasses multiple etiologies. Although it was previously believed that there was usually one primary etiology for a given case of dementia, it is now understood that most cases have three or more pathologies on brain autopsy that contribute to the dementia. This is one of the reasons no clear cure or preventive medication has been identified for dementia: most investigational medications have been targeted to only one brain pathology. Mixed Alzheimer’s disease/Vascular dementia is viewed by many as the most common form of dementia, based on brain autopsy studies in patients with previous cognitive assessments. FREE Patient Materials About E-Cigarettes and Hookah Are you looking for resources you can use when talking with your patients about e-cigarettes or hookah? The Physician Advocacy Network has created a set of patient materials to address common questions about these emerging tobacco products. may present in the early- to mid-stages of the disease, but usually resolve over 1-2 years. AD progresses in end-stage to complete loss of independence, requiring 24 hour care. “Pure” Vascular dementia is uncommon because there are usually other brain pathologies playing a role; thus the term vascular cognitive impairment is now more often used to describe the vascular component of dementia. Vascular pathologies include small and large infarcts, subcortical infarcts and microvascular arteriosclerosis, which presents in part as periventricular and subcortical white matter hyperintensities on brain MRI, or ‘white matter disease’. Prolonged hypertension is often associated with microvascular pathology. The natural history of vascular dementia was previously characterized by a step-wise or staccato-type pattern of cognitive decline associated with each stroke/TIA episode, followed by a plateau. Although the risk of dementia after a cortical symptomatic stroke is increased twofold, it is generally recognized that cases with several small or large sequential strokes are relatively infrequent. Instead, a more gradual course may be more typical due to subcortical, often asymptomatic infarcts and progression of microvascular pathology. Vascular cognitive impairment has classically been typified by greater impairment in executive function compared to memory loss, and often language (aphasia), but realistically the cognitive domains affected will be related to the areas of the brain affected by vascular pathology. Frontotemporal dementias (FTD) or tauopathies, are characterized by higher density tau tangles in the frontal and temporal lobes. Classic symptoms of FTD are personality changes due to disinhibition of the frontal lobe, such as increased swearing, sexual aggression, other socially inappropriate behaviors and mood swings. Word finding and verbal skills are impaired to a greater extent than memory initially. Onset is often in the 60s and 70s and life expectancy is usually 6-8 years after diagnosis. Lewy body disease/dementia usually occurs in the setting of Parkinson’s disease, but Lewy inclusion bodies are often found as concomitant pathology in other types of dementia. The α-synuclein protein is the primary constituent of Lewy bodies, and α-synuclein oligomers appear to play a strong role in the neuronal damage associated with Lewy body disease. The gene for α-synuclein, called SNCA, also increases the risk of Parkinson’s disease. At least 50% of patients with Parkinson’s disease will develop dementia, although not always Lewy body dementia. Lewy body disease symptoms include memory loss but also visual hallucinations, fluctuating level of alertness and cognitive symptoms, tremors and rigidity. Hippocampal sclerosis is a more recently identified contributor to dementia and is defined as severe neuronal cell loss and gliosis (scarring from dead neurons) in the hippocampus. About 15% or more of cases that were thought to be AD were due to hippocampal sclerosis in one study. Memory loss is the predominant early symptom, but its symptoms may mimic those of AD and FTD. How does Early Onset Alzheimer’s disease differ from the more common occurrence in the elderly? Early onset AD is defined as cases that are diagnosed before age 65. Most patients are diagnosed in their 40s and 50s and have familial AD, with an autosomal dominant inheritance (i.e. a child has a 50% chance of inheriting the gene if one parent had the gene). About 5% of all AD cases are early onset, or about 200,000 cases. Many readers may be familiar with the ongoing NIH-funded clinical trial of a new amyloid antibody, crenezumab, in a large extended Colombian family with early onset AD, led by Eric Reiman M.D. and his group at the Banner Institute in Arizona. Are there reliable genetic tests to disclose the probability of an asymptomatic young person eventually developing dementia? The APOE genotype on chromosome 19 is the most commonly tested genotype for Alzheimer’s disease. About 20% of the general population carries the APOE ε4 allele, which increases the risk of AD. (The APOE ε2 allele is protective, and the ε3 allele appears to be neutral). Although the ε4 allele increases one’s risk of developing AD, it is still not a reliable predictor of who will get Alzheimer’s disease. Previous studies have shown that even in people diagnosed with AD, up to 30% do not carry an APOE ε4 allele. Thus it is not generally recommended to get APOE genotype testing in an asymptomatic individual without a history of familial AD. However, it is has been shown that having one copy of the ε4 allele increases the risk of AD by about 2-3 fold (depending on whether the other allele is an ε2 or ε3 allele), and 2 copies of the ε4 allele increases the risk up to 15 fold. When caring for patients with dementia — how should providers handle history-gathering, decisionmaking, informed consent, especially in situations where the patient has limited insight into their own impairment? Providing care for dementia patients is at once challenging and rewarding — I find dementia patients fascinating. However, it is not possible to obtain an accurate history or informed consent for release of information or a research study unless the primary caregivers or an informant are present. It is not advisable for dementia patients to attend a clinic visit without a caregiver or reliable informant, who in some cases may be a nurse from a nursing home or assisted living. Tracking down critical information regarding a new symptom or behavior problems by follow-up phone calls is much less effective and very time consuming, and most clinics don’t have the luxury of a nurse with dedicated time to conduct such phone calls. Are there differences in treatment approaches depending upon which type of dementia exists — e.g. Alzheimer’s vs. Atherosclerotic (bilateral lacunar) vs. Frontotemporal? Yes, but the bottom line is that no medication has been identified that is effective in preventing or reversing dementia long-term. Donepezil and memantine are commonly used medications that may slow the symptoms of AD and vascular or combined AD/ Vascular dementia for one to two years. However, there are many ongoing national clinical trials with a broad range of medications and vaccines designed to either prevent or slow cognitive decline and dementia. Nasal insulin may prove beneficial in improving memory and is undergoing clinical trials nationally and here in the Twin Cities. Neurologist Dr. Mike Rosenbloom and Leah Hanson, Ph.D., are leading this study and currently enrolling eligible patients with mild cognitive impairment or early AD at HealthPartners Center for Memory and Aging (651-254-7936). In addition, the ongoing ASPREE (ASPirin in Reducing Events in the Elderly) trial sponsored by the National Institute on Aging, is measuring whether low dose aspirin 100 mg daily vs. placebo may decrease the risk of dementia, disability or death in 19,000 people 70 and older over about five years in the U.S. and Australia. I am the U.S. principal investigator for the ASPREE study, and the Berman Center for Clinical Research and Outcomes at HCMC is the U.S. coordinating center. ASPREE is in its fifth year of follow up, and we estimate the trial will end in 2018. It would be tremendously exciting if it turns out that a low cost simple aspirin a day could decrease the risk of dementia. The most effective lifestyle preventive intervention for everyone however appears to be regular exercise! Exercising including aerobic or strength-training for at least 30 minutes/day has been found to decrease risk of cognitive decline in multiple studies, and in one study regular walking slowed the rate of hippocampal shrinkage. Adhering to a Mediterranean or similar diet also decreases the risk of cognitive impairment. Early lifestyle intervention is key: the most effective time period to decrease or modify risk factors for cognitive decline is in middle age. Such modifiable risk factors include exercise, blood pressure, blood sugar/diabetes, abdominal obesity and a healthy diet. There are currently several ongoing European trials measuring the effect of multiple lifestyle interventions on cognitive decline; e.g., exercise, nutrition and blood pressure management. and senior care clinics to recruit from. More importantly HCMC and Hennepin Health Systems are dedicated to the research mission, and have recently entered a joint agreement with MMRF to provide career development research awards to promising young investigators to ensure the continued growth of our rich research heritage at HCMC. have an excellent group of eight Geriatricians and nine Nurse Practitioners that contribute to the fellowsâ&#x20AC;&#x2122; training, led by Drs. Lawrence Kerzner and Abigail Holley. Aspects of our Geriatric fellowship training include working in a team-based approach with nurses, social workers and PharmDs in providing longitudinal and geriatric consultation care of outpatients, nursing home and home care patients, dementia and Geriatric Psychiatry training at the Minneapolis VAMC, a falls prevention clinic, rotations in urinary incontinence with our Urologists, stroke clinic, Parkinsonâ&#x20AC;&#x2122;s and movement disorders at the Struthers Parkinsonâ&#x20AC;&#x2122;s Center, rehabilitation medicine, wound care, sleep disorders, bone metabolism, palliative medicine and biomedical ethics. Fellows participate with community agencies including the Minnesota Visiting Nurse Agency and Hospice of the Twin Cities in providing direct care in patient homes. Additionally, they work with the Hennepin County Vulnerable Adult Protective Service and the Vulnerable Adult Law Enforcement team to provide consultation visits with their social workers to clients in their place of residence, evaluating and advising regarding elder abuse, neglect, financial exploitation and self-neglect, and participation with the Minnesota Elder Justice Center. The totality of these Geriatric medicine educational experiences is unique among the training programs available to physicians and provides Geriatrics fellows with broad skills and perspectives targeted at helping seniors obtain maximal functional ability and independence, and helping them and their families manage illness and decline in the end of life period. Dementias: Neuropathology as a Tool to Unravel Etiology Contributed by H. Brent Clark, M.D., Ph.D. Figure A. Silver stain showing neurofibrillary tangles (on left) and senile plaques (on right) associated with Alzheimer’s disease. Figure B. Frontotemporal dementia with cytoplasmic inclusions immunostained for TDP-43 (brown foci). Figure C. Cortical neuron containing a Lewy body. There is a natural tension between hospitals needing to discharge in a timely fashion and nursing homes accepting patients that they can reasonably manage. At times this has led to less than full disclosure about the nature of cognitive losses, leading to inappropriate placement (e.g. assisted living vs. assisted living memory care). Families may perpetuate this miscommunication due to financial constraints* (see sidebar) or denial of the underlying condition. Ultimately, this is counterproductive. This leads to the excessive use of sedatives and antipsychotic medications and re-hospitalizations. Effective communication, on the other hand, leads to effective care planning, developed pre-transfer. There are special accommodations for rehabilitation of the delirious and demented resident: private rooms; rooms closer to the nursing station; non-pharmacologic interventions and careful medication reconciliation can all be beneficial in successfully transferring a dementia resident into a transitional care/skilled nursing care setting. Caring for dementia patients in LTC means developing a team of well-trained caregivers who communicate clearly with referral sources, engage with families, and learn to promote dignity for older adults as a primary therapeutic effort. Clinicians have a strong supportive role in nurturing this process. Gandalf gives of his own life in the mines of Moria to promote the safety of the “Fellowship.” While we give of ourselves, we hope the patient and their family will succeed in this battle against fear and darkness. John Mielke, M.D., CMD is an Internist/ Geriatrician who specializes in care of the elderly in nursing and assisted living facilities. He is a Certified Medical Director and Past President of the Minnesota Medical Director’s Association. He is the Chief Medical Officer of Presbyterian Homes. Alzheimer’s Disease: The Future of Diagnosis, Prevention and Treatment Contributed by Michael Rosenbloom, M.D. indicating impaired insulin production and signaling have linked Alzheimer’s disease and diabetes mellitus. Consequently, Alzheimer’s disease has been called a “type 3 diabetes mellitus of the brain”. (8) These insulin deficits have provided the scientific foundation for two ongoing clinical trials in Alzheimer’s disease. The National Institute on Aging-funded Study of Nasal Insulin to Fight Forgetfulness is testing intranasal insulin in mild cognitive impairment and Alzheimer’s at sites throughout the country, including Mayo Clinic. The HealthPartners Center for Memory and Aging is conducting a phase II, double-blinded, placebo-controlled trial of the rapid-acting insulin IN glulisine to measure its effects on cognition and disease progression in mild cognitive impairment and Alzheimer’s. Finally, Fang Yu, Ph.D., at the University of Minnesota is evaluating the effect of routine aerobic exercise on cognition in Alzheimer’s disease through the FIT-AD trial. Outcomes related to exercise also will be compared with traditional pharmacotherapy in this patient population. Conclusion Due to challenges associated with diagnosis, prevention and treatment, Alzheimer’s disease remains one of the most formidable chronic conditions. Ongoing research into the relationships among early-stage Alzheimer’s disease, amyloidosis and tau deposition will be critical in shaping the diagnostic approach and clinical trials of the future. In addition, novel treatments aimed at addressing the underlying mechanism of disease, whether it is related to amyloid deposition, tau aggregation or central nervous system metabolic disarray, provide optimism for an eventual treatment or cure for this devastating neurodegenerative disease. Michael Rosenbloom, M.D. is a board certified Neurologist and Director of the HealthPartners Center for Memory and Aging. His clinical and research focus includes FDG-PET and PIB imaging in focal presentations of Alzheimer’s disease, rapidly progressive dementia, initial clinical symptoms in patients with frontotemporal dementia spectrum disorders, and therapeutic interventions for dementia. References available upon request. components essential in dementia care; and to support clinicians at the point of care, by dementia-focused electronic health record designs that provide essential information, referral recommendations, and population-based tracking. Minnesota Brain Aging Research Collaborative (M-BARC), a project of the University of Minnesota N. Bud Grossman Center for Memory Research and Care in partnership with local healthcare providers and systems, seeks to advance these goals. For more information about M-BARC, visit m-barc.net. Soo Borson, M.D., Professor Emerita, University of Washington; Adjunct Professor, University of Minnesota, and Patricia Carlson, MPH, Associate Program Director, N. Bud Grossman Center for Memory Research and Care, University of Minnesota. Co-Leads, Minnesota Brain Aging Research Collaborative (M-BARC), m-barc.net. References available upon request. The road to life-changing treatments HealthPartners Institute is one of the largest medical research and education centers in the Midwest. Weâ&#x20AC;&#x2122;re part of an integrated health care organization that includes hospitals, clinics and a health plan. Together, our multidisciplinary teams are helping transform health care across the nation. HealthPartners Neuroscience Center, coming to St. Paul in 2017, will be the largest freestanding neuroscience center in the upper Midwest â&#x20AC;&#x201C; a place where innovation and hope can thrive. Thus, it is clear that brain injury is absolutely, unquestionably injurious to the brain with complex multifactorial consequence. A single brain injury is unlikely to cause dementia but is associated with psychiatric consequence. Although the potential connection between CTE and NFL players has recently been popularized by media outlets such as 60 minutes and the movie Concussion, multiple brain injuries have impact far more complex than the diagnosis of CTE can explain. It is unclear whether reported anecdotal cases of CTE associated with clinical dementia, such as seen with studies published by the Boston University group and those seen in the movie Concussion, are results of ascertainment bias, repetitive TBI or multifactorial in origin. More robust studies with unbiased selection of subjects that prospectively look at brain injury in both athletes and nonathletes are necessary to objectively detect, classify and treat harmful effects of TBI. Sports participation/avoidance of sedentary lifestyle, which are known to decrease risk of hypertension, diabetes, dementia, cardiovascular disease and cancer, should be encouraged even as efforts to make sports as safe as possible are pursued. Neurosurgeon Uzma Samadani, M.D., Ph.D., is the Rockswold Kaplan Endowed Chair for Traumatic Brain Injury Research at Hennepin County Medical Center (HCMC), and an Associate Professor of Neurosurgery at the University of Minnesota. She can be reached at: Uzma.samadani@ hcmed.org. Jessica Flores is a second year medical student and American Heart Association Summer Research Scholar at the University of Minnesota. She is currently performing brain injury research in the laboratory of neurosurgeon Uzma Samadani M.D. Ph.D.
We need early detection and a team approach using care coordination to avoid more preventable crises and improve quality of life and care for people living with dementia. new action steps after the event, including: • Establish standardized protocols for identification, diagnosis and care coordination. • Implement use of the MiniCog screen for cognitive impairment in Medicare annual wellness visits during clinic rooming process and in all hospice and home health admissions. • Embed dementia algorithm in electronic health record. • Develop a clinical pathway similar to other chronic diseases for home health patients. • Form a care team and navigator to support people with dementia. • Pilot a dementia chronic care management program. • Incorporate dementia awareness into grand rounds. • Identify a physician champion. • Explore how dementia is incorporated into risk models. post-diagnostic care, as well as potential reimbursement opportunities through the proposed changes to the 2017 Medicare Physician Fee Schedule. Minnesota can do better with our care delivery and supports. Ask how you can get involved in changing the future of dementia by contacting Michelle Barclay, ACT on Alzheimer’s, at mpbarclay@barclaygp.com or (612) 408-2910. ACT on Alzheimer’s is a statewide, multi dimensional collaboration seeking large-scale social change and building community capacity to transform Minnesota’s response to Alzheimer’s disease. A signature goal is to help health care providers and systems become dementia capable. Tools and resources for health care providers and systems are available at www.ACTonALZ.org/ provider-resources. to climate change and its effects on our patients. In the meantime, we encourage you to look into this issue. Here are some useful resources: 1. Making the Connection: Climate Changes Health — APHA and ecoAmerica cosponsor a four-part webinar series investigating the health impacts of climate change. The series explores the connection between climate change and key areas of our health. http:// www.apha.org/climate-changeshealth?utm_medium=email&utm_ source=webinarpolicyemail&utm_ca mpaign=ecoamericawebinar1replay& utm_content=climatechangeshealth. For Physicians in Minnesota. . . Hearing Loss, Dementia And Your Patients Hearing loss is a leading cause of dementia. A medical study at Johns Hopkins Medical Center found that hearing loss can increase your patient’s risk of developing Dementia by 200-500%. Social isolation, cerebral atrophy (aka. brain shrinkage) and increased cognitive load (e.g. the amount of work your brain uses to hear) are considered to be the basis of hearing lossinduced dementia - even for individuals with a mild hearing loss. Hearing Loss & Dementia How are they Connected? But.... recent evidence from Columbia University finds that restoring hearing with today’s leading treatment options could prevent or slow down the development of Dementia. Are Your Patients At Risk? Establish Your Risk. Individuals with hearing loss are at a increased risk for developing cognitive decline and Dementia. While the risk increases with degree of hearing loss, it is important to note that even a mild hearing loss (e.g. having some difficulty hearing in background noise, turning up the TV a bit more than your spouse / family, having a hard time following a conversation in the car, etc.,) can increase your patient’s risk of Dementia. he Convenings is a unique, multi-layered community engagement program designed to inspire and motivate individuals and families across Minnesota to have meaningful conversations about living and dying well. This exciting new effort builds on the work of two significant initiatives: Honoring Choices Minnesota, a state-wide effort to engage Minnesota families in end-of-life care decisions, and an award winning series of broadcast conversations and book by journalist Cathy Wurzer that chronicles the life of Bruce Kramer, former Dean, University of St. Thomas College of Education, who lived an extraordinary life in the face of terminal illness. The goals of The Convenings are to: • Inspire people to think about and discuss their choices for living and dying well. • Evoke a sense of urgency for such conversations. • Build/spark communities of care throughout the state. • Empower community leaders with skills and resources to stimulate conversation and increase public awareness of living and dying well. • Share stories about and ideas from what other communities are doing. These goals reflect a growing need for authentic discussion and thoughtful decision making as society grapples with an ailing and rapidly aging population. Senior Physicians Association Fall Meeting Vice President for Health Sciences and Dean, University of Minnesota Medical School Brooks Jackson, M.D. was the guest speaker at the September 27, 2016 meeting of the Senior Physicians Association. Presenting an “Update on the Medical School,” he stated that the medical school and Twin Cities Medical Society have shared interests in advancing health care and are partners in training of students — our future leaders. Priorities included: cultural diversity; the cost of medical education/debt; research; and a legislative agenda. The first meeting of the Senior Physicians Association for 2017 will be held on February 28. “Understanding Aid in Dying” will be presented by Rebecca Thomas, M.D. — A topic that is sure to generate much discussion at the upcoming legislative session. Please calendar these future meeting dates and watch your email for additional information: February 28, 2017 May 2, 2017 October 10, 2017 Questions? Contact Nancy Bauer at TCMS (612) 623-2893; nbauer@ metrodoctors.com. Marilyn Joseph, M.D., President, Senior Physicians Association, and Brooks Jackson, M.D., Vice President for Health Sciences and Dean, University of Minnesota Medical School. See Additional Career Opportunities on page 31. W E L L A N D BE YO N D Fairview Health Services seeks physicians with an unwavering focus on delivering the best clinical care and a passion for providing outstanding patient experience. With just one click you will find information on the latest TCMS news, events and legislative issues; Board and committee actions; past issues of MetroDoctors; and new career opportunities! Be part of a collaborative team that puts patients at the center and is transforming health care for today and tomorrow. LUMINARY of Twin Cities Medicine By Marvin S. Segal, M.D. SANNE DAIL JONES MAGNAN, M.D. through those “series of doors.” Those meaningful steps resulted in a broad array of benefits to our medical profession and the welfare of the patients to whom we minister. Along the way, Sanne’s leadership skills were sharpened. She applied her medical and scientific background with newfound capabilities in finance, audit and currently mushrooming technological initiatives. All of those background competencies allowed her to marshal the forces necessary to lead in effecting successful care guideline acceptance and institution, and delve into the advancement of three important aims: improving the quality of patient care experiences, bettering the health of populations, and decreasing the per capita cost of health care. Dr. Magnan is now encouraged by the ongoing shift from volume to value-based care and payment — for which she has been a driving force — as she assumes new positions as both a Senior Fellow of HealthPartners Institute for Education and Research and Co-Chair of the Population Health Improvement Roundtable of the National Academy of Medicine. The good Dr. Magnan, who — in addition to her professional activities is an avid walker; an accomplished hosta gardener; a loving daughter, mother and wife; and the possessor of superb rhubarb recipes — loves tackling goals that bring people together to solve issues, actions that she has followed diligently where all stakeholders play a role and work together. So, we now have an answer to the mystery of that common thread weaving its way through the marvelous career of our LuminaryCOLLABORATION . . . just one of Dr. Sanne’s secrets of success. This last page series is intended to honor esteemed colleagues who have contributed significantly to Twin Cities medicine. Please forward names of physicians you would like considered for this recognition to Nancy Bauer, managing editor, nbauer@metrodoctors.com. This Thanksgiving, carve out time for the conversation.